Russia's Olympic torch relay has been the longest and most ambitious ever staged – a four-month, 40,000-mile trek that has seen 14,00 people carry the flame on foot, by snowmobile, on horseback – and even by space craft. But the relay leading up to the Sochi 2014 Winter Games in February has been clouded by a string of mishaps that reached its nadir earlier this week. On Monday, an official said a torchbearer died of a heart attack after carrying the Olympic flame as part of Russia's torch relay. 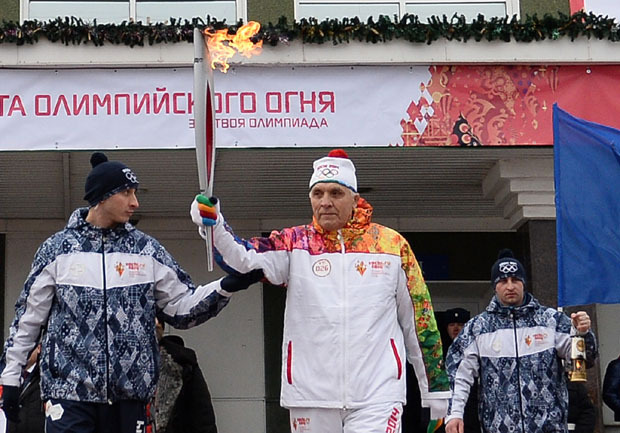 Vadim Gorbenko, 73, a sports school director and Greco-Roman wrestling coach, felt ill after walking 500 feet with the torch in his home city of Kurgan in western Siberia, said Roman Osin, spokesman for the Sochi 2014 torch relay. "We express our deepest condolences to his loved ones." Before Gorbenko's death, the torch relay had been plagued by a string of problems – mostly related to the torch itself. The flame has gone out dozens of times since President Vladimir Putin handed it off in Red Square on Oct. 6, and once it had to be relit by a civilian with a Zippo lighter. Last month a torchbearer's jacket caught fire as he carried the flame though another Siberian city.